Assalamu `alaykum wa rahmatoLlahi wa barakatuhu! 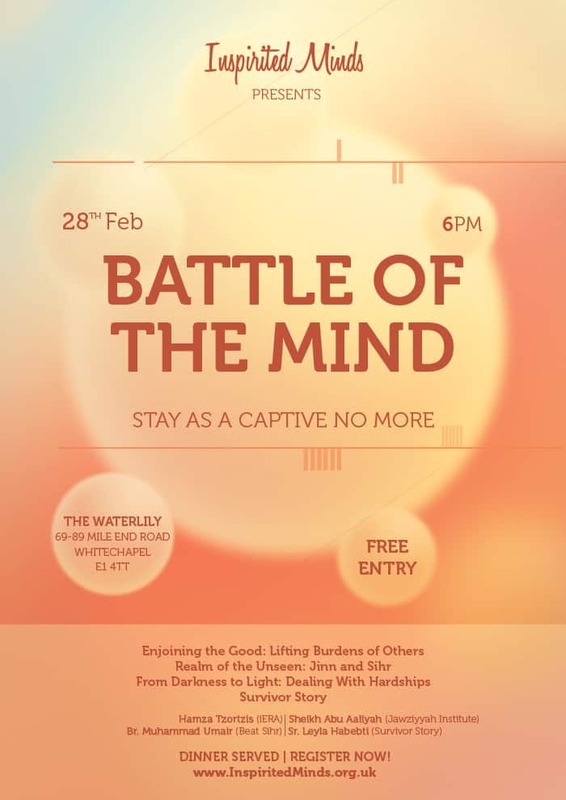 Inspirited Minds is delighted and thrilled to invite you all to our first event of the year, a unique launch event which will endeavour to approach the topic of mental health illnesses in the Muslim community —expressively though not exclusively with respects to depression— from various angles in light of the Qur’an and Sunnah! Unfortunately many of us are unaware about the mentioning of mental health illnesses 1400 year ago from the lips of our beloved salAllahu `alayhi wa sallam, whereby the feelings and thoughts of those who were suffering were not left unattended. Sadly however, this is not the case today. Whilst the sufferers in our era are made to feel irresponsible, inadequate and as a result, alienated away from society, our prophet salAllahu `alayhi wa sallam spoke beautifully to a mentally ill woman who sought consolation from him when he said, “I am at your service,”. But, are *we* at *their* service, too? Are we that compassionate handhold? Are we that attentive ear? Are we that generous heart? Are we amongst those who are reviving the sunnah of our prophet salAllahu `alayhi wa sallam, or, are we participating to the growing silenced society which brings further discomfort to our brothers and sisters who are already suffering? There is a very grave battle that takes place in the minds of the many which when abandoned and unapproached spiritually and socially with time, could only become worse; in some upsetting cases, to the point of death. Thus after our realisation of the severity of this subject matter, we must enter into these fields of war and tackle one thought after another which our brothers and sisters have suspended into, to bring to their awareness that they are not alone – in this battle of the mind. FREE ENTRY | REGISTER NOW! You’ve lost your mind, imaan and Allah!